Alias Mohd Noor Obtained his PhD in Mechanical Engineering in the field of Turbomachinery from University of Bath, England, UK in 1990, and experienced as academician since 1980. 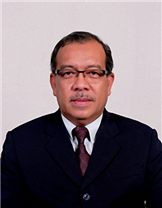 Dr. Alias Mohd Noor is a Professor in Mechanical Engineering with specialization in Turbo-Machinery, Hydraulic Machinery, Fluid Mechanics, Internal Combustion Engines, Heat Transfer and Gas Dynamics. He has vast experience in academic administration. He used to be Dean, Faculty of Mechanical Engineering and Deputy Vice Chancellor (Student Affairs) at Universiti Teknologi Malaysia. Some of his research works through publication were given recognition and won prizes, for example prize for his publication in Journal of Power, Proceedings of Institute of Mechanical Engineers, namely “Arthur Charle’s Main Prize”, awarded by Institute of Mechanical Engineers, United Kingdom. Currently he is holding administrative posts as Executive Advisor of Low Carbon Transportation Research Centre in collaborating with Imperial College London and as Director of BioMedical Engineering Research Centre. He is responsible in developing the first Turbocharged Engines Laboratory for the country and among the best in the world with the collaboration of Imperial College, University of London, under the umbrella of the joint research centre called LOW CARBON TRANSPORTATION RESEARCH CENTRE UTM-IMPERIAL.